Playing with Sticky Dinosaurs. Fling this sticky dinosaur around and watch how it sticks to everything in its wake. They are elastic and fantastic, providing hours of fun. Children will love flinging these sticky dinos T-rex, Triceratops, Stegosaurus and Spinosaurus. 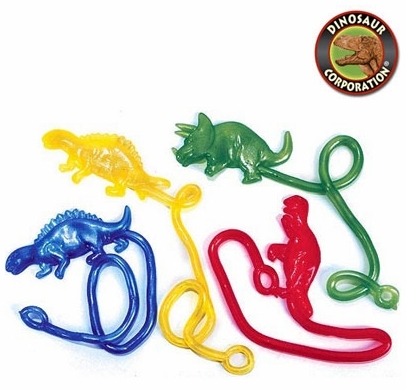 * Place these fun dinosaurs in dinosaur goodie bags.